I've occasionally found myself clicking randomly around in space looking for interesting systems. Perhaps a bit silly way to pass time. And in the real world few survey the sky manually these days anyway. So I wrote a quick bash script which clicks randomly in the Space Engine window, grabs the window contents, extract the top left part, remove the stars and run in through OCR. Loop. I put Space Engine in spacecraft mode, set it for a course through the central Milky way and let the script run overnight. I got the descriptions for about 85,000 systems in 8 hours. I can probably increase the efficiency by a factor of a few if I pipeline the image processing and OCR. For some reason the spacecraft speed had dropped a lot overnight (doesn't Newton's first law apply in spacecraft mode? ), so there probably were many duplicates (the OCR wasn't perfect, so it's a bit hard to tell). I found several binary systems with 27 planets. I haven't seen that before. But no systems with more than 3 worlds with life. Perhaps I need to figure out why the spacecraft almost stopped, so I can cover a larger area. I'm using xdotool, xwd, ImageMagick and gocr for the job. This is in Linux. I've no idea what would work in Windows. For some reason it doesn't work to send key events to Space Engine, so I'm restricted whatever can be done with the mouse. Perhaps it's a Wine thing, that the normal X Window events somehow get circumvented. Really cool system you've invented here midtskogen, I look forward to seeing what comes of it and what discoveries you make. Heh, I have spent hours going through the universe map looking for interesting things, so I don't think it's cheating. Developing an automated method for searching and cataloging them is pretty novel. And you're getting about 3 systems per second with this? That's not bad at all! As for your ship velocity changing -- if I recall correctly Space Engine has a few different modes of movement/framerate, so maybe you went into a more CPU-intensive area of the galaxy and this caused your speed to decrease. I'm not sure if that's exactly how it works, but it's my best guess anyway. Does your system sort different kinds of star systems, like single brown dwarfs, or stars without any planets, or one with a green atmosphere? As you can see, the OCR isn't very good (but I can train it). Still good enough for basic searching. I also store the corresponding image of the text, so I can get the exact star name if it's unreadable. I've only spent like 10 minutes on the script, apart from the bit trying to eliminate the stars which will confuse the OCR, so there's plenty room for improvements. Performance wise I think I can get 1 million systems in a day with a few simple tricks. I let it run a few more hours today and surveyed another 50,000 systems. Still no systems with more than 3 live worlds. This is a pretty interesting way to find systems, what happens if SE crashes? Awesome and good idea, strangely I actually thought and wondered about a program like this because I wanted to cycle through thousands of systems more quickly looking for anomalies like stars with 8+ life worlds and other interesting things. Weird how you didn't find any stars with more then 3 life planets in 85 thousand systems. Maybe someone else could make something that could work on Windows as well. It would be interesting to see the strangest systems possible after tweaking a program like this to scan an entire galaxy. If Space Engine crashes? It doesn't. Well, in that case xdotool will fail and I wont get random clicking around on my desktop which could be bad... I should add some basic error testing. I was thinking of a galaxy scanner for debug purpose. It's interesting to me to collect statistics, apply realistic observational selection effect and compare with a real exoplanet catalog. It would be useful to tweak the planetary system generator. I may add some console commands like "select random star" or "select next closer star", and "write star data to the file". With such commands, it would be possible to implement random space exploration script (like screensaver), with collecting statistics. Generated star data file is a text file that can be processed and analysed by external software. I may add some console commands like "select random star" or "select next closer star", and "write star data to the file". With such commands, it would be possible to implement random space exploration script (like screensaver), with collecting the statistics. 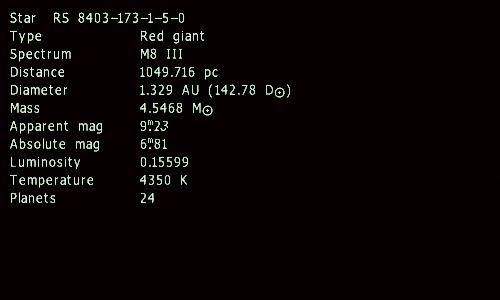 Generated star data file is a text file that can be processed and analysed by external software. Please also add some more screenshot options, such as (I've already suggested it) appending screenshots to a single file (not simply %08d.tga or whatever), which will allow external applications to read the video easily, since it's not easy to read the latest files from the capture directory. If the file is a pipe, it's trivial to produce video encoded in any format while Space Engine runs, or even stream live from Space Engine. I ran into this need again today. My autopilot script is a dirty hack, so I thought I should do it better. I just wrote a C program which reads the files from the capture directory as Space Engine produces it, extracts the text and every time it changes, it prints it out and the screenshot files are also deleted, so I can run Space Engine in F9 mode without worrying about disk space. This is much faster than before. Is anyone interested in helping out on this? I only have a few minutes now and then, so this might not turn into something very useful or user friendly for a while. I'm attaching what I have now. It's a program that should run first. Then delete any files in screenshots/capture, make sure Space Engine saves screenshots as tga, and start Space Engine. Hit F9 to start the fun, and the program will print as text whatever new text appears in the top left corner of the Space Engine window. It's a logger, sort of. It assumes that gocr is installed, but ideally a custom OCR should be used. It shouldn't be hard since it only needs to support one font. It can do simple SAD matching. What I have now is just a start in case anyone is interested in this. Has your system found anything higher than a Septuple? There's language entries for Octuple but I've never run across one. A couple of them have been found by people, but they are quite rare. The first one is a bit odd. 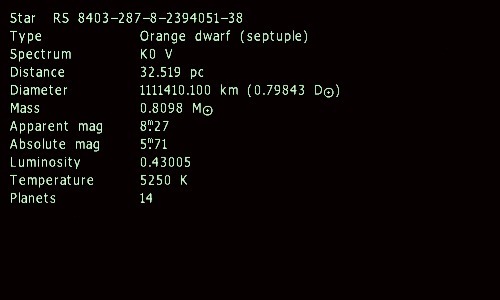 It had 12 planets, no life, when it was surveyed, but now (on a different computer, though), it has life. This could be useful to spaceengineer if you could publish some statistics on your findings. What type of star is more common? It should be red dwafs, as in reality. The statistics would be more accurate if it comes directly from the algorithm, rather from something that has been through the user interface, been grabbed and OCR'd, and only having parts of the information. For us users it would be nice to have a simple sqlite database, so we can make SQL queries asking for specific stuff. For instance, "give me a list of binary yellow dwarfs with at most 8 planets, but a least 2 with life". Currently I have a list of 300,000 systems, but the OCR isn't good enough for making that database. Automatic exploration is simple in 0.97. SE doesn't accept keypresses sent to the window by external programs, but mouse clicks work as in 0.96, so everything has to go through that, and luckily the star browser can be opened that way. I made a quick script which looks for the closest stars, saves them, go to a random star in the list and repeats. I left it overnight and in 7 hours it listed 470,000 stars. Unfortunately, only 69,000 of them were unique, so I seem stuck in the same neighbourhood. So the script needs some refining. At least it's possible to map automatically. I wise thing probably is to switch off everything in the view settings to minimise the risk of crashes.